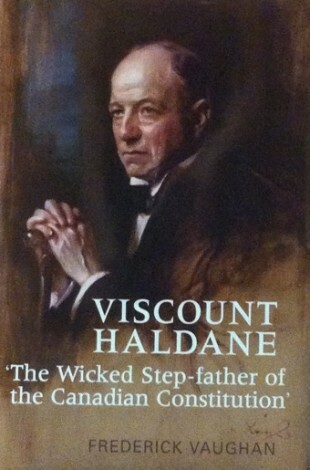 Viscount Haldane: "The Wicked Stepfather of the Canadian Constitution"
by Frederick Vaughan, Professor Emeritus, University of Guelph. Published with the University of Toronto Press, 2010. Lord Haldane is well-known to historians of Canadian constitutional law as one of the Privy Council judges most responsible for re-shaping the division of powers in the direction of greater provincial power after World War One. This deeply-researched biography Fred Vaughan, author of a biography of Emmett Hall published by the Osgoode Society in 2004, puts Haldane’s Canadian decisions in the context both of Haldane’s life and thought and prior Canadian jurisprudence. Haldane’s education, his devotion to Hegelian philosophy, his work as a leading barrister, his various causes, especially education reform, and his service in the War Cabinet are all analysed, as are some intriguing personality quirks. What emerges is a picture of a complex and deeply principled jurist, and a better understanding of why we got the constitutional division of powers that we did. Reviews of Viscount Haldane: "The Wicked Stepfather of the Canadian Constitution"
Viscount Haldane: “The Wicked Step-father of the Canadian Constitution" is a meticulous examination of Haldane’s role in reworking Canadian federalism and of Hegel’s influence on Haldane’s jurisprudence. Frederick Vaughan is scrupulously fair to Haldane… This is a thoroughly researched and thought–provoking biography, which will be useful for scholars of Canadian history, politics, and law, as well as those interested in the evolution of the commonwealth.’ Stephen Azzi, The Historian, Vol 74, 2012, p. 640. David Schneiderman, McGill Law Journal, Vol 57, 2012, p. 597. Michael D. Behiels, American Historical Review, Vol 117, 2012, p. 188. Michael Lines, Canadian Law Library Review, Vol 36, 2011, p. 178. Ged Martin, British Journal of Canadian Studies, Vol 24, no 2, 2011, p 264. Hamish Telford, Journal of Historical Biography, Vol 10, 2011, p. 142. John N. Davis, Slaw: Canada’s Online Legal Magazine, 24 September 2010. Frederick Vaughan is Professor Emeritus of political studies at University of Guelph. He was previously a Visiting Fellow at Wolfson College, Oxford and Osgoode Hall Law School. He now lives in Nova Scotia.